Printed by M. Rivadeneira in Quito. Colour matching between Scott and Gibbons is difficult in this case. The green one real stamp was for inland mail only, the yellow was for mail to foreign countries. 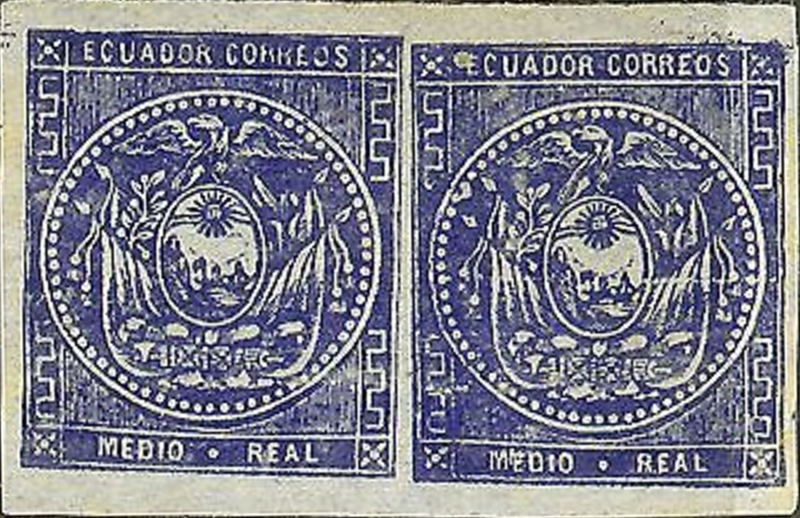 Paper with the arms of Ecuador embossed was used for some sheets of Scott #2, 4, 5 and 6. Paper with the paper makers watermark is known on #2 ("Bath" and crown) and #4 ("Rolland Freres"). Scott #6, the 4 reales, is in a different design than #1 - 5. About one in five of Scott #6 have the oval of the design 15 to 15½ mm wide, making it almost a circle. The most common width is 13½ to 14 mm. Stamps in the same design as #1 - 5, but in the values 2, 8 and 12 reales, are bogus. The printer, M. Rivadeneira, apparently also was the master behind some of the existing forgeries. Image from Stanley Gibbons marketplace.